Next week Samsung will officially launch the Samsung Galaxy Note II during the IFA 2012 show in Berlin. We still have no clear idea what the device will look like, although we’ve seen a bunch of concepts already. 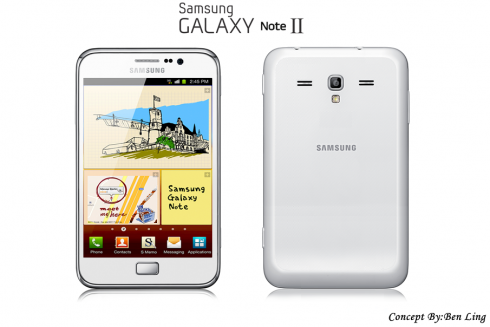 Ben Ling has a new one, a mockup of the Galaxy Note II, that you can check out below. He also offers us some specs, that are actually realistic for today’s technology. The new Galaxy Note features a 5.6 inch Full HD Super AMOLED TFT touchscreen display, TouchWiz UI version 4.0 and a quad core 1.7 GHz Cortex A9 processor. At the back we find a 12 megapixel camera with LED flash and the ability to record 1080p video video. The front 2 MP camera does 1080p capture as well. Galaxy Note II runs Android 4.1 Jelly Bean in this case and offers a Li-Ion 2600 mAh battery on board, plus 32GB of storage and 2GB of RAM. NFC completes the list, together with a 9.3 mm thick chassis and the usual S Pen stylus. The phablet weighs 175 grams and gives you Bluetooth 4.0, as well as a microSD card slot. This 2012 Galaxy Note is a bit of a wide affair, since I would have expect it to be longer and not so wide. It’s also interesting to note those 4 speaker grilles, two on each side of the camera, guaranteeing a great audio experience. The real model will probably look nothing like this from what I’ve seen on the web.